Made from the finest White Chungking Chinese Hog Bristle. These natural flagged tips are hand-cupped and set in the required shape for clean sharp edges. Used for all Sign and Banner work. Made with a unique blend of Squirrel Hair and Black Taklon. These lettering brushes are best suited for use with Watercolors and all water-based products. Developed for use with the new One Shot Paint. 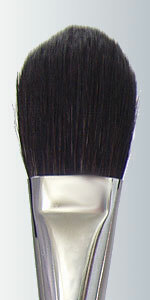 Unique blend of Squirrel Hair and Black Taklon. Used for blending and strokework. 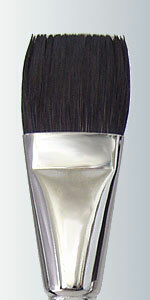 This brush is loved for its soft texture and ability to hold a lot of water. Best suited for water-based products but can be used in all mediums. Ideal for use with One Shot Paints. 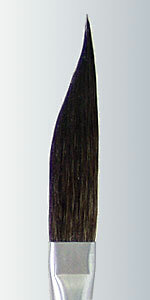 A unique blend of Squirrel Hair and Black Taklon. 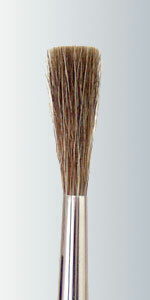 Wonderful brush for China Painting. Ideal for watercolors and all water-based products. Used by Sign Painters with the new One Shot Paints. Its soft texture is great for painting on glass, rice paper, silk and for sumi painting. 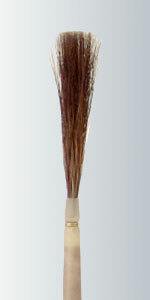 A unique blend of Squirrel Hair and Black Taklon. Ideal for use with all water-based products. Great for use with the new One Shot Paints. 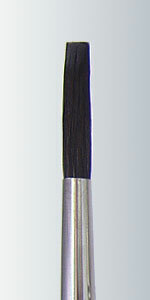 These brushes hold their chisel edge and shape. Great for backgrounds and other large pieces. 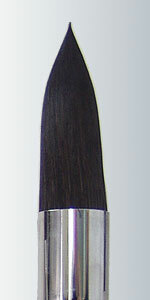 Unique blend of Squirrel Hair and Black Taklon. Developed for use with Watercolors and all water-based products but can be used in all mediums. Used by Sign Painters with the One Shot Paints. Works well when used on glass, silk and sumi painting. 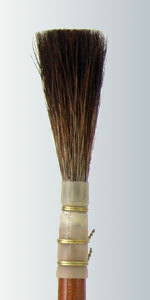 Unique blend of Squirrel Hair and Black Taklon. Ideal for use iwth Watercolors and all water-based products but can be used in all mediums. The Sign Painter will love this when used with the One Shot Paints. 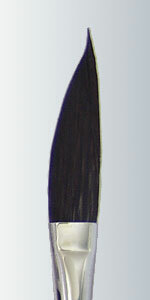 These Daggers are used to make ribbons, leaves, borders, and all types of linework. Made with the finest Grey Talahutky Squirrel Hair available. 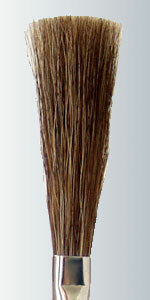 Mounted with Synthetic Quills for uniformity. Used for all types of lettering. 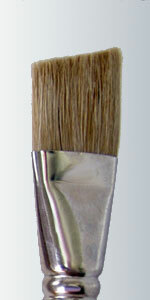 This Grey Hair is suitable for painting on all surfaces. Made with the finest Grey Talahutky Squirrel Hair available. Mounted with round nickel plated ferrules. These Liners are great for outlining letters and scrollwork. 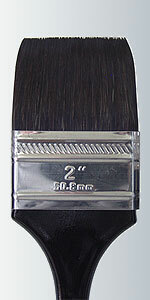 This Grey Hair is suitable for painting on all surfaces. Made with the finest Grey Talahutky Squirrel Hair available. Mounted with flat nickel plated ferrules. 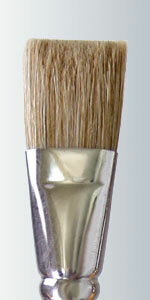 This Grey Hair is suitable for painting on all surfaces. Made with the finest Grey Talahutky Squirrel Hair available. Mounted with round nickel plated ferrules. 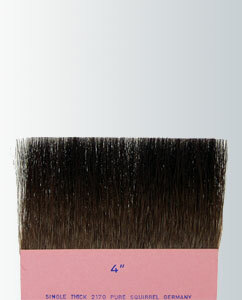 This Grey Hair is suitable for painting on all surfaces. Made with the finest Grey Talahutky Squirrel Hair available. Mounted with flat nickel plated ferrules. 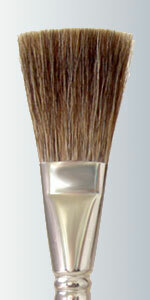 A great single stroke brush for lettering on trucks and banners. Holds a sharp chisel edge. 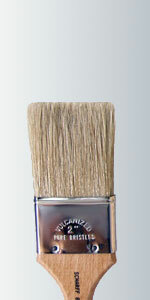 This Grey Hair is suitable for painting on all surfaces. Made with the finest Brown Kazan Squirrel Hair available. 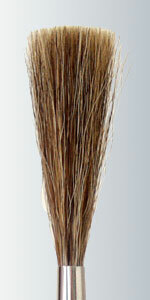 Mounted with Synthetic Quills for uniformity. Ideal for painting on glass and very smooth surfaces for a sharp, clean, professional look. 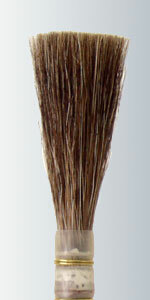 A 4" wide, 55 mm long, single line of Squirrel Hair. 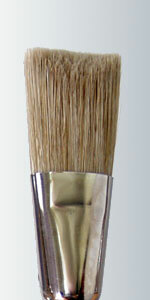 Used for the application of Gold Leaf. Made with Pure Squirrel Hair with short handles. Used to pinstripe cars, trucks, and vans. Also used for banding, ribbons, and more.